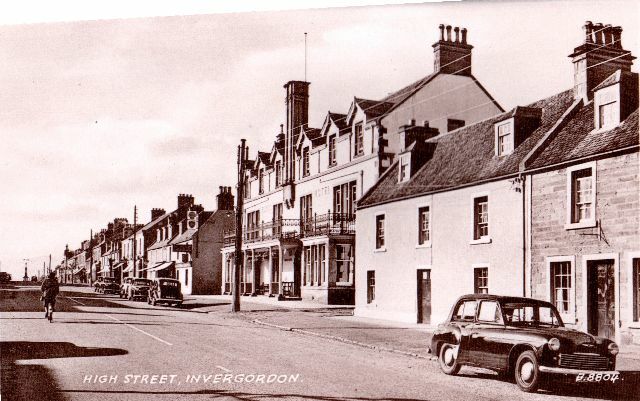 A postcard of the High Street, looking west. The Royal Hotel looks superb. The Hillman Minx parked on the right is from the 1950s which gives an approximate date for the picture. Brian, study of the original scan yields the registration as being RGB 657. The 'R' and the '6' are questionable. Has anyone seen an original of this? I'd like to know the car's registration number which is obscured. It must be parked more or less opposite the SAI office where my father worked as "agricultural agent" (rep) and he had this model of Minx - from Wm. Munro's of course. Not the one I'm looking for then. Thanks for checking.